Eligibility and Limitations. Participants and winner(s) must be U.S. residents at least 18-years old. Each qualifier must disclose his or her legal name, address, telephone number and Social Security number. Upon disclosure of the above information, the person will be officially eligible to be declared a winner despite any such inference on the air. Any person found to have supplied false or misleading information may be disqualified from the contest and would therefore forfeit the prize. All entrants to any contest both imply and agree to participate in the contests and obey the rules by their participation in the contest. Telephone Contests: If a contest is a call in to win contest and/or a telephone is needed to participate in the Contest, participants are restricted to the use of ordinary telephone equipment. Participants that enable the “Caller ID” block function will not be allowed to participate unless they enter their correct area code and telephone number if prompted, or disable the features inhibiting their participation in the Contest. No liability is assumed by the Companies for faulty, mistranscribed, misdirected/misdialed telephone communication or technical difficulties experienced by callers throughout the call-in portion of the contest including: failed, incomplete, garbled or delayed transmission of online entries, traffic congestion on telephone lines, the Internet or at any website or lost or unavailable network connections which may limit an online entrant’s ability to participate in the Contest, and any injury or damage to entrant’s or any other person’s computer related to or resulting from participating in or downloading any information necessary to participate in the Contest. Calls for contestants are taken in order of receipt. In the event that more than one voice is heard on the phone line, the contestant/qualifier or winner will be the first person to speak. If the judge(s) is not able to determine which caller was first, a random drawing will be held to determine the winner. The use of switching or programming equipment by telephone company employees is in violation of contest rules and is not permitted. Telephone contests with “cues to call” are only official when heard on-air via radio. Due to delays in audio transmission, internet streaming is not a valid contest option. Mail/Fax Contests: Only one entry per person will be accepted unless otherwise specified on-the-air or in separate contest rules. Winning entry(s) will be drawn at random from all valid entries received. The companies are not responsible for late, misdirected, lost or mutilated mail, entry forms or faxes. No liability is assumed for any malfunction of computer equipment, fax machine equipment or fax machine telephone lines. If entry is illegible or does not supply all information deemed necessary to declare a winner, entry will be deemed invalid and another entry will be selected. Entry Form Contests: Contestants must complete an official entry form and deposit it in the provided entry box. Only one entry per person for each contest. Winning entry(s) will be drawn from all valid entries received. If entry is illegible or does not supply all the information deemed necessary to declare a winner, entry will be deemed invalid and another entry will be selected. Web Site Contests: To enter a contest on the station’s web site, contestants must complete all the information deemed necessary to be declare a winner. No liability is assumed by the station for any malfunction of the internet or individual computer systems. Only one entry per person for each contest. Winning entry(s) will be randomly selected from all valid entries received. If entry is illegible or does not supply all information deemed necessary to declare a winner, entry will be deemed invalid and another entry will be selected. When entering a contest via an advertiser’s web banner or logo hyperlink, station is not responsible for prize fulfillment or any aspect of the contest. Station is simply a “link” to that advertiser’s site. Companies have the right to require a winner to sign an affidavit of eligibility and release within three (3) days of notification or station can determine an alternate winner at random. All prizes (not date sensitive) must be claimed no later than sixty (60) days after winning. If prize has not been claimed by this date, winner forfeits the prize and station reserves the right to select another winner. Prizes are non-transferable and substitutions of cash or equivalent, unless otherwise specifically stated in the contest rules are not allowed other than a substitution by station that may be necessary due to the unavailability of a prize. If concert, other ticketed event, gift certificate or coupon has been awarded as a prize and the concert, event, place of business, or product is postponed, rained out, cancelled or for other reasons, beyond our control, does not occur/exist, station will not be responsible for replacing the prize. Prizes not redeemed by expiration date are no longer valid and will not be replaced by station. Employees of Companies and their affiliates, subsidiaries, advertising, production, promotion and fulfillment agencies, other broadcast companies and their immediate family members and/or those living in the same household are not eligible for any contest. The term “immediate family” includes spouses, siblings, parents, children, grandparents, and grandchildren, whether as “in-laws,” or by current or past marriage(s), remarriage(s), adoption, co-habitation or other family extension, and any other persons residing at the same household whether or not related. Each contestant agrees that Companies can use his/her voice, name and likeness for promotional purposes without additional compensation. By participating in the Contest, where allowed by law, participants agree that the Companies may disclose personal information obtained from participants in the Contest to third parties and use such information for marketing and other purposes. All participants agree to and are bound by official rules and the Companies reserve the right to establish additional rules at any time. Contests are void where prohibited or restricted by law. All Federal, State, Local laws and regulations shall apply. The conduct of the Contest is governed by the applicable laws of the Unites States of America, which take precedence over any rule to the contrary herein. Companies reserve the right to disqualify any contestant and determine an alternate winner at random in the event that any of these contest rules are not met. Contestant must provide legal ID and a photocopy of legal document showing Social Security number (example: Social Security Card) to claim prize. To receive prize, winner will be required to sign a legal release form and execute a W-9 tax form. It is understood that an Internal Revenue 1099 Form, to report on the value of any such prize as earned income, will be issued for such purposes by either station, or its promotional partner issuing the prize. Winner agrees to accept the estimate of fair market value. This is applicable to all prizes valued at $600 or more, including cash won, that adds up to $600 or more in any given year. Each winner is solely responsible for reporting and paying any and all applicable taxes related to the prize(s) and paying any expenses associated with any prize which are not specifically provided for in the official rules. Should a winner die before claiming his/her prize, said prize will be awarded to winner’s estate, subject to all other applicable laws. No purchase or consideration is necessary to win. Decisions by station regarding winner and all contest details are final and binding in all respects. If the conduct or outcome of the Contest is affected by human error, any mechanical malfunctions or failures of any kind, intentional interference or any event beyond the control of the Companies, the Companies reserves the right to terminate this Contest, or make such other decisions regarding the outcome as the Companies deems appropriate. ANY ATTEMPT BY A CONTESTANT OR ANY OTHER INDIVIDUAL TO DELIBERATELY CIRCUMVENT, DISRUPT OR DAMAGE ORDINARY AND NORMAL OPERATION OF THIS CONTEST, TELEPHONE SYSTEMS OR WEBSITES, OR UNDERMINE THE LEGITIMATE OPERATION OF THE CONTEST IS A VIOLATION OF CRIMINAL AND CIVIL LAWS AND SHOULD SUCH AN ATTEMPT BE MADE, COMPANIES RESERVES THE RIGHT TO SEEK DAMAGES FROM ANY SUCH PARTICIPANT TO THE FULLEST EXTENT PERMITTED BY LAW. Station and its sponsors are not responsible for any typographical or other error in printing of the offer, administration of the sweepstakes or in the announcement prizes. In accepting a prize, the winner accepts to take the prize as outlined in such promotion. Dates for concert, flight departure/arrival, weekend stays, etc, cannot be changed by winner. If winner is not able or chooses not to accept prize “as is”, winner forfeits his/her prize. Station reserves the right to select another winner. Winner is responsible for all costs associated with travel to any venue or event for which a prize was awarded, unless otherwise specified. Winner agrees to accept all blackout dates, space availability requirements, etc. established by Company’s prize partner(s), such as hotels, airlines, trains, ships, etc. Winner agrees that acceptance of any trip taken as a prize from station does so entirely upon their own initiative, risk, and responsibility. If the trip requires traveling outside of the United States, the winner, upon winning the prize, must have a valid US passport. If the winner does not have a valid US passport upon winning the prize, the trip may be forfeited. All winners, by acceptance of prize, agree to release Companies and their promotional partner(s), and clients, together with their respective parent companies and subsidiaries from any liability, claims or actions of any kind whatsoever for injuries, damages, or losses of any kind to persons and property which may be sustained in connection with the receipt or use of prize or while traveling to or from any prize related activity. Odds of winning are undeterminable and depend on varying telephone response rates, internet access and/or the volume of entries received. If any portion of the above rules is determined to be unenforceable due to local or state laws, all other portions of these official rules shall remain in effect. Companies retain the right to amend these rules and regulations at any time for any reason, without notice or priornotification. When the radio station conducts a contest where they have to call back listeners that have qualified, we will continue calling said qualifiers until one is reached over the phone. Contestants can be disqualified at any time for any reason by station management. 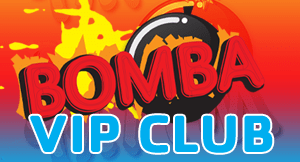 How do you listen to Bomba?